What is a North Dakota Eviction Notice? North Dakota Eviction Notice: What Is It? A North Dakota eviction notice is a completed written form or document used by a landlord or a property manager. Its purpose is to act as both documentation for the landlord and notification to the tenant that the tenant neglected to do something that they promised they would do when they signed the lease agreement. An eviction notice is better known as a notice to quit. They give the tenant an explanation for why the document was issued and provides a certain amount of time (three days) to correct the problem or vacate the property. All North Dakota eviction notices must comply with the state’s landlord-tenant laws. What Are the Components of a North Dakota Eviction Notice? The name of the eviction notice. This generally includes a descriptive term that illustrates why the notice was created, such as non-payment of rent. The date that the notice to quit was created by the landlord or the tenant. The name of the tenant or tenants who signed the lease. This is the person or persons ultimately responsible for upholding the terms of the lease or rental agreement. You may find it helpful to include the date that the lease or rental agreement was signed. The full address of the rental property, including the city or town and county where the property is located. An explanation for why the notice to quit was created and served on the tenant. The date by which the problem must be corrected or the tenant must vacate the property. The printed name and contact information for the landlord or the tenant, including the phone number. The signature of the person issuing the notice. The landlord or property manager will also need to complete a Certificate of Service. This is instrumental if the tenant is sued because it gives the date service occurred, the name of the person who was served, how they were served, and is signed by the person who completed service. 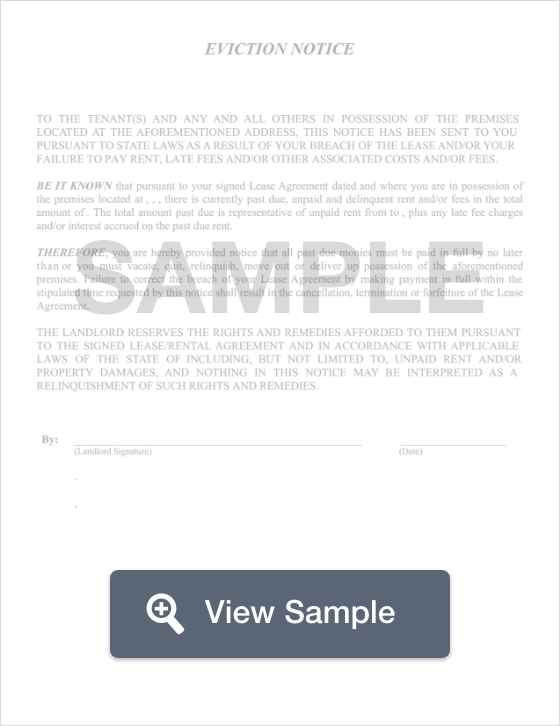 This document will need to be notarized if the tenant is served in person or by mail. In North Dakota, service of an eviction notice may be done by serving the tenant personally, by mail, or by getting the tenant’s signature to prove that they are aware of the notice. Service must be done by the Sheriff or another third-party who is at least 18 years old. Landlords or property managers may NOT serve the notice because they are a party involved in the action. A 3-day to quit for non-payment of rent is an eviction notice that informs the tenant that they’re being evicted because they did not pay their rent. Under § 47-32-01.4, the tenant has three days to pay the past due rent or vacate the property. The notice should include the full amount of rent that is past due, the acceptable methods that can be used to pay the rent, and where the rent may be paid. It should also give the three-day deadline for payment or to leave the rental property. A 3-day notice to quit for non-compliance alerts the tenant to the fact that they violated the lease or rental agreement in some way other than non-payment of rent. Under § 47-32-01, the tenant has three days to correct the problem or leave the property. This notice should clearly explain when and how the lease or rental agreement was violated by the tenant and give the three-day deadline. A 30-day termination of a month-to-month tenancy isn’t an eviction notice in a traditional sense. The tenant or the landlord can use this document to notify the other party that they are ending the month-to-month tenancy and that the property will be or must be vacant at the end of that 30 days. This notice should give the 30-day deadline by which the property should be empty and returned to the care and custody of the landlord. This notice is governed by § 47-16-07. What Are the Legal Considerations of a North Dakota Eviction Notice? Remember that in North Dakota the landlord or their agent may NOT serve the tenant with the eviction notice. A third-party who is over the age of 18 years must be used for the process of legal service. The Certificate of Service may need to be notarized depending on how the eviction notice was served. You can learn more about service under the previous section. A landlord or their agent may not sue the tenant unless and until the eviction notice is properly served and the tenant does not comply with it. The court plays an important part in the eviction process. Without a court order, the landlord may NOT replace the locks, shut off the utilities to the property, or remove the tenant’s belongings. Using those methods, known as self-help, is illegal without a court order. There are two other main forms of illegal eviction: retaliatory eviction and evicting someone because of discrimination. Retaliatory eviction involves the landlord attempting to evict the tenant for reporting a code violation or uninhabitable conditions of the property to the housing authority. Landlords have a legal obligation to keep the property safe and habitable. Tenants have a right to safe and habitable conditions. Landlords may not evict a tenant due to their actual or perceived race, skin color, religious beliefs, the country they come from, disability, gender, or family status. Family status includes pregnancy, adoption, or the birth or presence of minor children. If the landlord uses an illegal eviction method, they may be sued by the tenant for financial compensation. North Dakota tenants have rights even during the eviction process. You can find a copy of these rights on the Attorney General’s website. If you receive an eviction notice, make sure that you read it carefully. It should tell you why it was issued and the deadline by which you either need to correct the problem or vacate the property. For non-payment of rent and for rental agreement or lease violations, you have three days to take care of the reason for the eviction or vacate the property. You must be legally served by someone who is over 18 and who is not the landlord or their agent if you are served in person. You may also be served by mail. The service agent may also ask you to sign an acknowledgement that you received the notice. The landlord may not file an eviction lawsuit against you until you are legally served and you do not comply with the notice. Until the landlord has a court order from the judge, they may not install new locks, turn off the utilities to the rental property, or dispose of your property. Landlords also may not evict you because you report uninhabitable living conditions or code violations to the housing authority. You also may not be evicted because of your race, skin color, chosen religion, your home country, gender, physical or mental disability, or family status. If you believe that you’ve been subjected to an illegal eviction or if you just have questions about how the eviction process works in North Dakota, you can talk with a landlord-tenant attorney. For possible illegal evictions, they will evaluate the facts and let you know whether you have a legal claim against the landlord. If you do, they can tell you about your legal options. You can also contact University of North Dakota School of Law and ask whether they have a legal clinic. Legal clinics provide low-cost or free legal help. You can also contact North Dakota legal aid. If you meet their income guidelines, you may be able to get free or affordable legal help. They also have several resources available for tenants. North Dakota landlords must ensure that they follow the laws associated with housing and eviction. For example, landlords or their agents may not personally serve the tenants. They must use someone who is at least 18 years old and who is not a party to the eviction. Landlords must serve the tenant in person or by mail. An eviction notice is an essential step because the landlord may not file a lawsuit against the tenant for eviction without first serving this notice and waiting the three days to determine whether the tenant will abide by the terms of the notice. Landlords may not engage in an illegal eviction practice such as retaliatory eviction, self-help eviction, or eviction based on what is known under federal housing law as the seven protected classes. This is discussed in more detail under Legal Considerations. Landlords who use illegal eviction may face a lawsuit filed by the tenant. If the tenant wins the lawsuit, the landlord may be required to pay financial compensation to the tenants or fines for breaking the law. Landlords with questions about eviction or their rights and obligations under the law should make an appointment with a landlord-tenant attorney.